Throughout the month of February, the American Heart Association is asking the nation to rally together and donate for all the reasons that make life precious. For the second year in a row, LBX Company, Lexington, Kentucky will support the Life is Why We Give™ campaign by giving $500 to the AHA for every Link-Belt® excavator, forestry machine or material handler retailed in February in North America. LBX is also challenging their North American dealers to support their local AHA chapters. 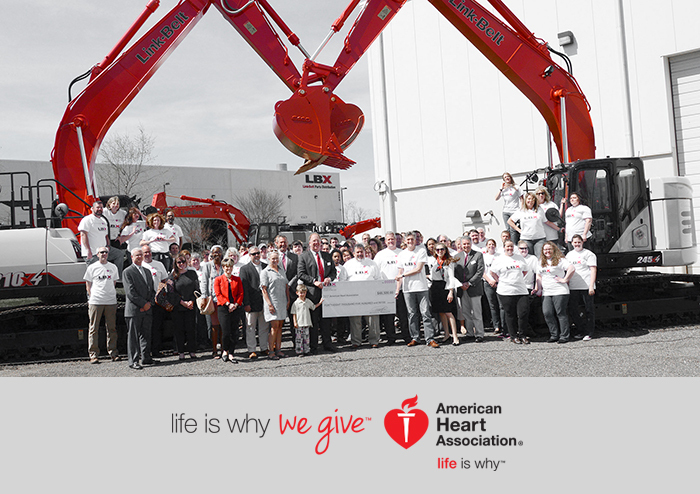 During February, many Link-Belt excavator dealers will participate in a special campaign that encourages both employees and customers to get involved locally with the American Heart Association through charitable donations or volunteering their time. Your local AHA chapter can help you get started with ideas for increasing engagement and establishing volunteer programs that will have a positive impact on your community throughout the year. To find your local chapter, go to www.heart.org/HEARTORG. To learn more about company promotions and special Life Is Why We Give™ events, please visit www.heart.org/lifeiswhywegive. Donations can also be made directly to the American Heart Association by visiting www.lifeiswhy.org/donate. Donations will help benefit research, public education and community health initiatives of the American Heart Association and the American Stroke Association. In February, the American Heart Association is urging Americans to unite in support of healthy living and the American Heart Association by participating in campaigns led by supporters around the country – including making a donation at participating retailers, purchasing specialty products to benefit the AHA, attending fundraising events and more. Life Is Why We Give allows consumers to think about their reasons to live healthier, longer lives and to give in honor of those reasons. Too long, heart disease and stroke have stolen our precious moments. In February, we fight back together and affirm that we’re more powerful than these diseases… because everyone has a reason to live a longer, healthier life… and that reason is why we give.